Fiesta, as most people will know means party. Asado is a term in Argentina which refers to the social event of having a barbecue. So Fiesta del Asado in Edgbaston literally means barbecue party. It’s the first of its kind in Birmingham, and is growing in popularity, drawing discerning diners out of the city centre and along the Hagley Road into Edgbaston where the Argentine sun is always shining. I was invited along to review the experience. As you walk in, you’re instantly greeted by smiling staff, who make you feel like you’re walking into a friend’s house for dinner. They take your coat, ask how your day was, and offer you a drink as you make your way to your table. 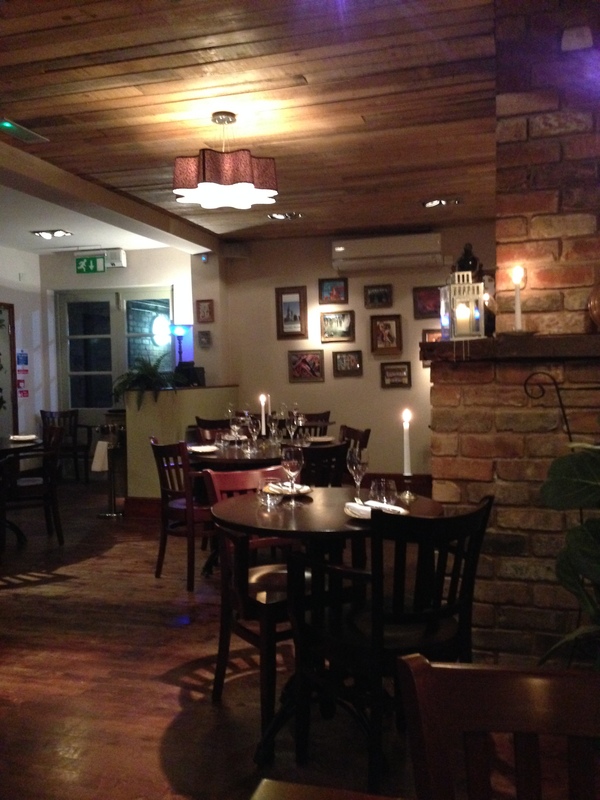 The décor is warm and welcoming too with dark wood, candlelit tables and the sunset like glow from the open kitchen. I was seated in a quiet corner next to a window with a painting of an Argentine soldier on the wall to keep me company. I had a glass of the Sangiovese/Malbec and marinated olives stuffed with guindilla while I studied the menu. The olives were fat, tasty and the guindilla provided a spicy kick which I loved, and definitely got my appetite going for dinner. Now, I won’t pretend that Fiesta is for everyone. 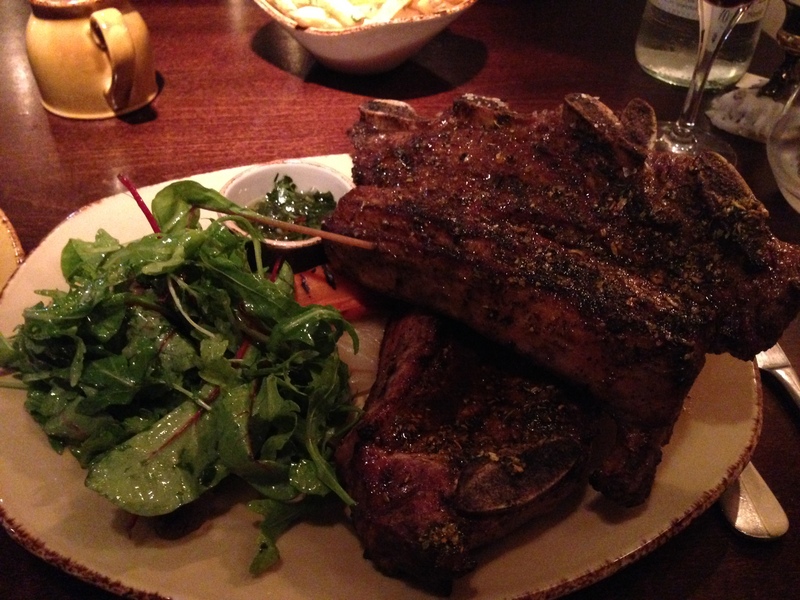 If you’re a vegetarian it’s not really the place to go, but if you’re a steak lover then you’ll be spoiled for choice. The Asado menu has a cut for every palatte, from a fillet like piece that is tender and lean, to a cross cut of ribs that has all the fat, bone and flavour to satisfy even the most cave-man like of carnivores. There’s also a wide selection of starters including Pata Negra ham and spicy flame grilled sausages. 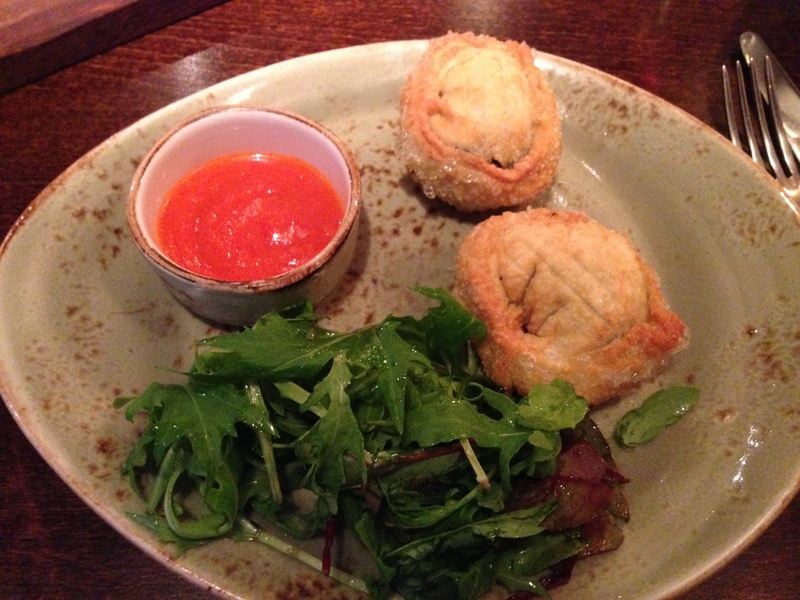 To start with, the empanadas caught my eye. I love these traditional Spanish pastries and the last time I had them was at La Bouqueria in Barcelona, so to see them on the menu here, I just had to have them. The beef and potato came highly recommended, but as I knew I was having steak for main I opted for the provolone cheese and spinach. 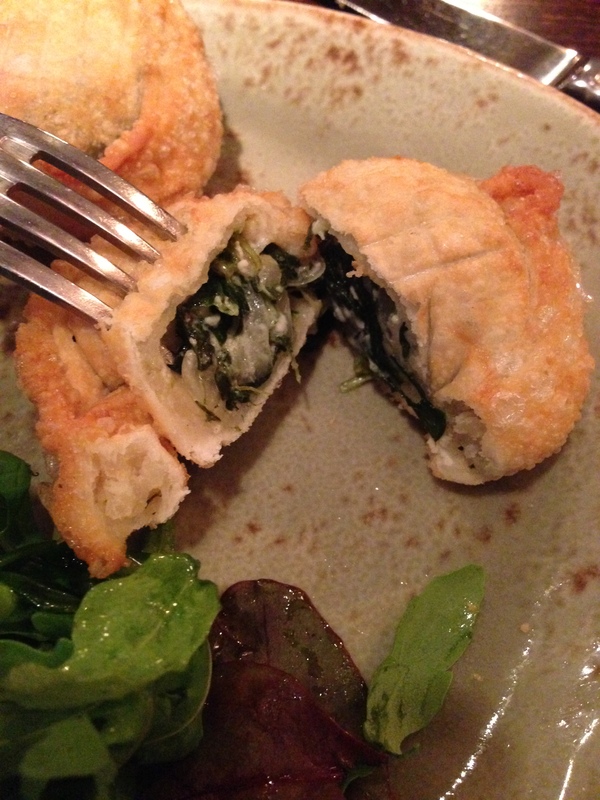 They were perfectly cooked, crispy on the outside, with oozing cheese on the inside, and despite the moist filling from the spinach and cheese, the pastry stayed beautifully flaky, not soggy at all. They came served with a dressed green salad and roasted red pepper sauce, which was smoky and had just enough kick to cut through the richness of the cheese. The empanadas were just the right size to start with and set me up for my steak. 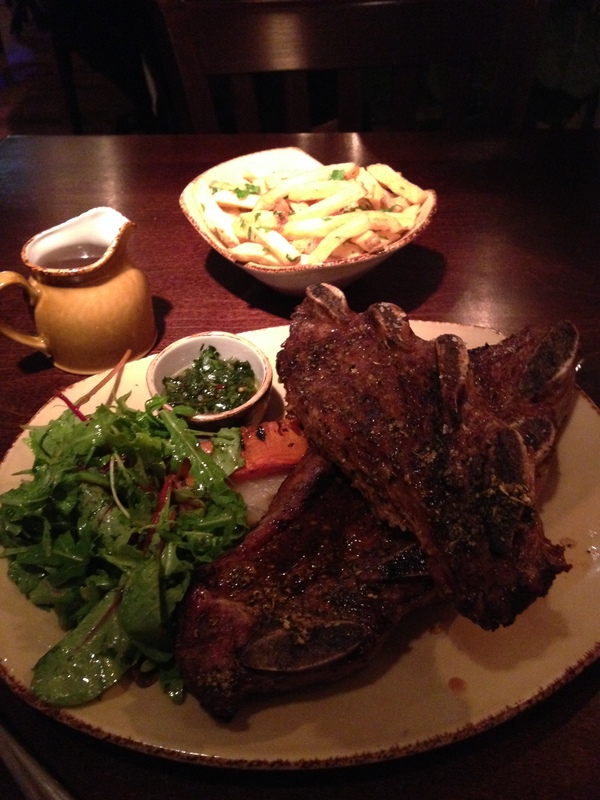 I went for the Asado de Tira on my waiter’s recommendation, as I love meat cooked on the bone. The staff know the menu so well that they can recommend dishes based on your personal taste. The Asado de Tira is a cross cut of ribs, so it has all the flavour of the bones, plenty of fat and a texture you can get your teeth into. I think it’s safe to say that this dish is a bit of a showstopper, as it turned the heads of every other diner, and someone on the table next to me even ordered it after seeing mine! The Asado de Tira comes medium rare with salad and chimichurri I also ordered the malbec reduction sauce and papas fritas with parsley and garlic. The meal was a beast, the 2 pieces of steak were huge, with different parts bringing different flavours, from the belly piece with its good layer of fat, to the tender nuggets of meat in between the rib bones. The flavour was absolutely amazing, very intense and so delicious I really didn’t want to leave any! The texture was fantastic too, from melt in the mouth pieces, to chewy bits you can really get your teeth into. The papas fritas were rustic with the skins on, and loads of garlic flavour which I loved, and complimented the beef really well. However, the meal was so big I couldn’t finish it all on my own, so my lovely waiter wrapped it up for me so I could take it home! I literally didn’t have room for dessert, which I was very disappointed about as the amaretto tart sounded gorgeous, so I had an espresso to round off the meal. The coffee was punchy and just what I needed to keep me awake for the journey home after such a huge dinner! I really do love this restaurant, from the atmosphere, to the brilliant staff who make you feel so at home and make sure you have the best possible dining experience, to the rustic, beautiful Argentine food. If you’re a meat eater, I highly recommend Fiesta Del Asado, and I wouldn’t hesitate to come back again and again. My meal was complimentary, many thanks to Fiesta Del Asado, but all opinions are my own.